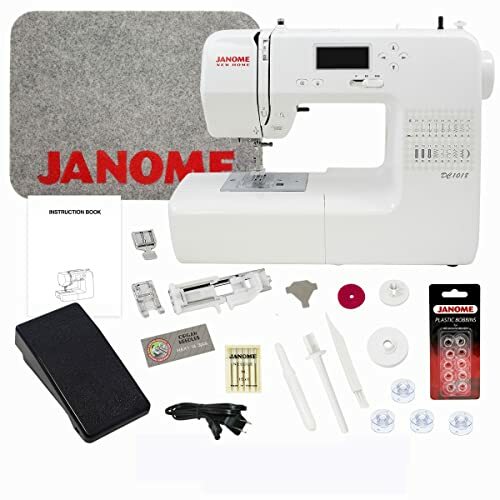 Janome DC1018 Sewing Machine - Is This Product Worth The Money? With thousands of machines in the market, it can be difficult for you to choose a single one that suits your needs. Don’t you agree? Finding a machine that is affordable and rich with features can be a tough decision to make. But Janome DC1018 can be the answer to your search. This machine comes with amazing features ideal for your use. 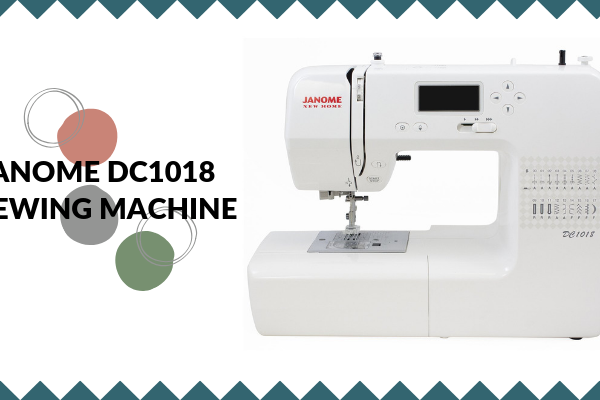 Keep on reading this Janome DC1018 review to find out more. In this post, we’ll focus on some of the amazing features of this machine. So, without further ado, let’s get into it! 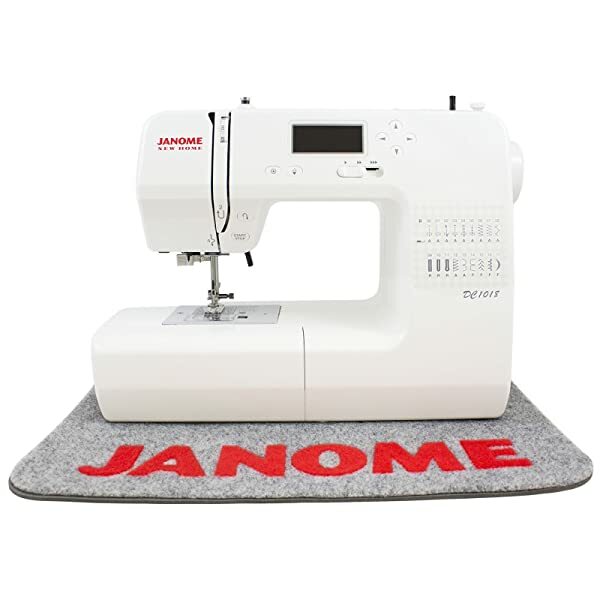 1 Why Buy Janome DC1018? 9 Where to Buy Janome DC1015? 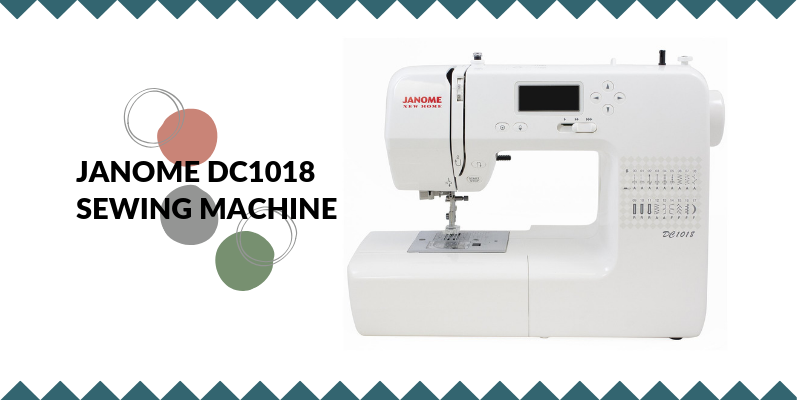 Janome DC1018 is a very affordable machine. Since it is computerized, this machine is very reasonable and every sewing fanatics favorite. Janome was founded in 1921. It was famous as the Pine Sewing Machine Factory in Japan by Yosaku Osem. It was later renamed to Janome Sewing Co. in the year 1954. Thus, the company aims to allow the user to make the most out of their creativity. Janome DC1018 is a fairly basic looking machine. It looks like an average machine and has a white body. This machine is small in size and will not take a lot of space on your working table. It is also only 15.6 pounds and can easily be lifted from one place to another. This machine may not be the kind of machine you take to the sewing machine classes with you. Nor is this machine perfect for traveling. But, it is definitely light enough to move around. However, with its heavy plastic exterior, this machine looks durable. The dimension of this machine is 19 x 14.3 x 10.5 inches. Janome DC1018 comes with a warranty of 25 years. This warranty is in mechanical parts. Janome also has a 2-year warranty on electrical parts and one year on labor. The warranty helps in protecting the problems with workmanship and materials. During the first year, Janome allows you to receive replacements for any parts that may be defective. They also provide the labor needed free of charge. However, after the first year of owning this machine, any part defective can be replaced without any cost, but you must pay for labor required for fixing your machine. This warranty does not cover damages caused by the owner. Nor does this machine cover damages caused by wear and tear. This warranty, however, is only applied to machines bought by an authorized retailer. 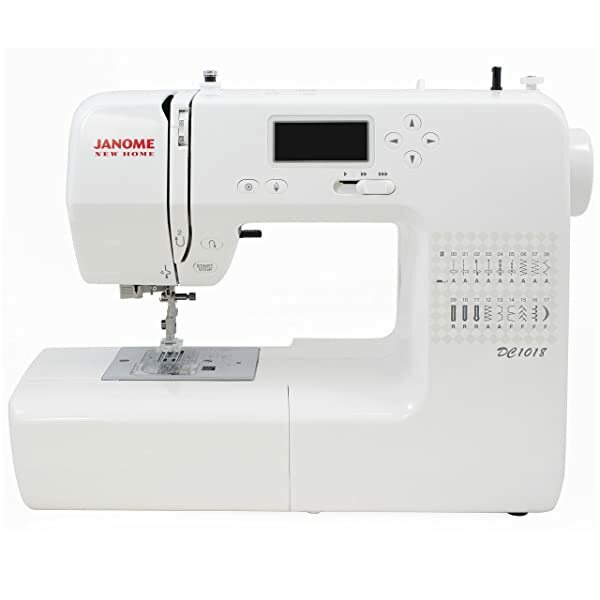 The Janome DC1018 comes with 18 built-in stitches. These include a buttonhole stitch, zigzag stitch, and a reverse stitch. These stitches include three one-step buttonholes. 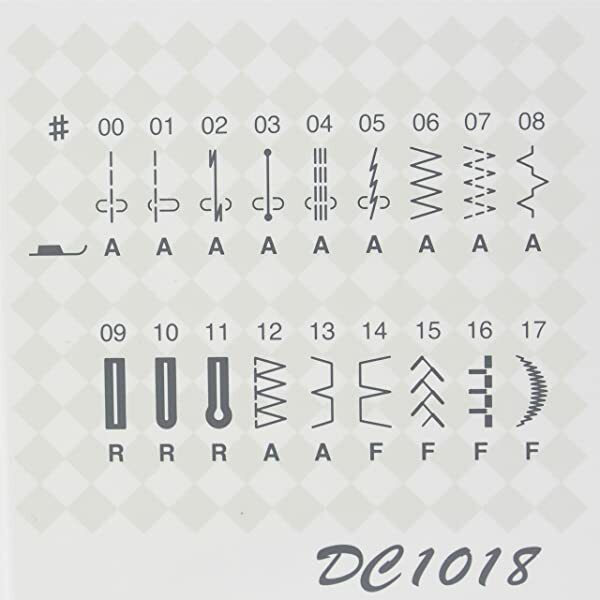 Janome DC1018 has an automatic needle threader. This helps in preventing any strain to your eyes. This automated needle threader increases the ease of use. You can say bye-bye to wrecking your eyes due to threading the needle. With the help of a simple four-step process, you can sew easily. This feature is essential for you if you are feeling slightly overwhelmed. It is also great if you want to exert a little more control over your stitching. The speed control slider on Janome DC1018 is great. It offers you are a beginner then the low speed is perfect. Once you are more confident, you can crank it up. Winding the bobbin on the machine and setting the thread spool is very easy. This can be done quickly if you follow the instruction. This machine also has a handy bobbin winding guide that will help you out. With this feature, you don’t have to worry about adding too much thread on your bobbin. It works great for both beginners as well as experts. Once the bobbin has a thread on it, the winder will stop automatically. This feature lets you lower the feed dogs to drop below the needle plate. This way when you sew, the feed dogs won’t be used. You can use this for free motion sewing where you need to maneuver and turn the fabric constantly. However, don’t worry. If the feed dogs are down, you will still have full control over the speed and direction of the fabric. That’s not all. This machine also has tough motor capabilities. This motor allows you to deal with all kinds of fabric. 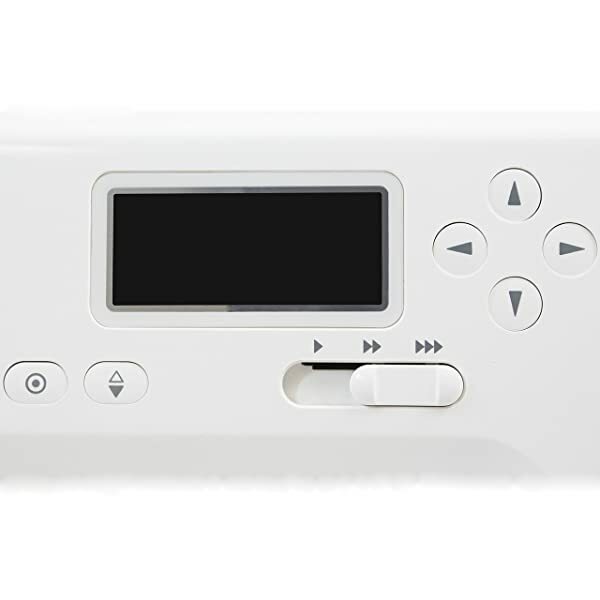 Janome DC1018 also has a programmable up and down button. In fact, this button is a blessing for people who want to quilt. This button acts as a second hand. The locking stitch button on this machine is also very amazing. This button is vital as it allows you to secure the stitches. This way, the stitches do not get lost. Janome DC1018 also has an easy reverse sewing button present right above the start and stop button. Moreover, the LCD display on this appliance is very good. There are quick selection buttons present that allow you to choose stitch selection. Stitch adjustments and selections are simple to understand. Even people over the age of 60 will not have trouble using it. The maximum stitch length provided by this machine is 5mm whereas the width is 7mm. 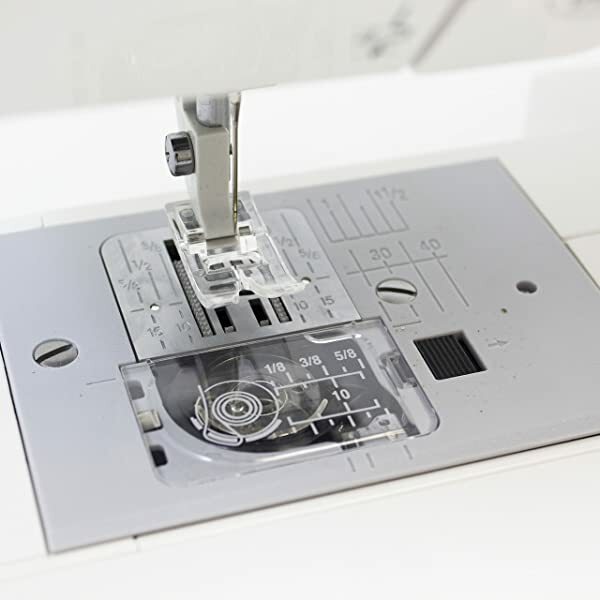 On the Janome machine, you can adjust the thread tension manually. The presser feet of this machine are a slide on. So, you no longer have to grab a screwdriver in order to switch between feet. The top drop-in of the bobbin will make it easy for you to use. This machine comes with a soft cover. It also has a bonus kit included. This review will be incomplete without discussing its pros and cons. Where to Buy Janome DC1015? As mentioned above, this machine has been around for quite some time. This brand is no stranger to craft and sewing stores. In fact, many retailers carry this machine in-store and online. Considering the price and the quality of this machine it is worth the investment. Moreover, this machine has great features for a beginner. The quality of Janome DC1015 is also excellent. In fact, you can understand its quality with its outlook. Moreover, the board on this machine has a variety of stitches. The stitch quality is also impressive and amazing. In short, it can be a great choice for someone looking for a budget-friendly and computerized machine.